Indonesia-based Sahid Hotels & Resorts is set to foray outside the country with an Uzbekistan property opening mid-2019. 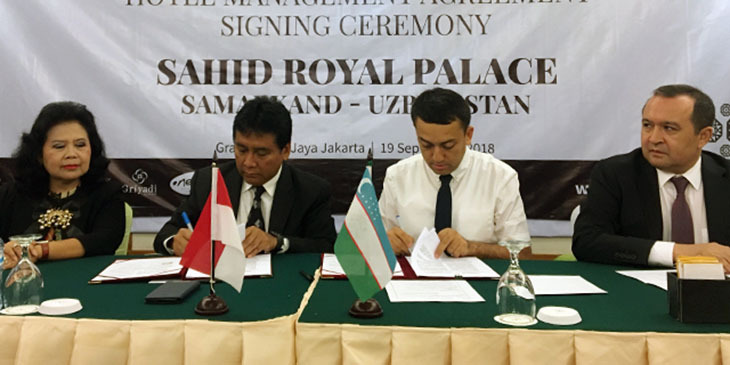 Under the Operational Management Agreement signed in Jakarta on September 19, Sahid Hotels & Resorts will manage a three-star hotel owned by Royal Palace in Samarkand, one of the largest cities in Uzbekistan. The 65-room Sahid Royal Palace Samarkand will be the company’s launch property. There are also plans for further expansion in the city, including a 200-room hotel in the memorial complex of Imam al-Bukhari. Vivi Herlambang, director of business development, sales & marketing of Sahid Hotel & Resorts, shared that Sahid Royal Palace Samarkand will target travellers from China, Europe, Japan, and countries around Central Asia. Hariyadi Sukamdani, president director Sahid Hotel & Resorts, said that as a country that has just opened up after being separated from the Soviet Union, Uzbekistan has seen extraordinary development. In addition, Uzbekistan would make an interesting destination for Indonesian Umrah pilgrims as it is home to many relics of Muslim civilisation, such as the memorial complex of Imam al-Bukhari. Ulugbek Rozukulov, ambassador of the Republic of Uzbekistan to Indonesia, said that the presence of the Sahid Hotel & Resorts in Uzbekistan represents potential to strengthen cooperation between the two countries. “Currently there are no direct flights from Indonesia to Uzbekistan, but flights can be made through Kuala Lumpur,” Ulugbek said. In addition, there are now direct flights from Jeddah to Uzbekistan. Not only is Uzbekistan interested to bring the Sahid Hotel & Resorts brands into the country, it is also keen in developing human resources.